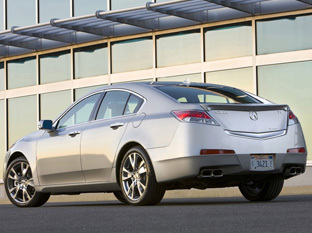 The 2009 Acura TL introduced a new face for the TL model. One not everybody will find appealing. 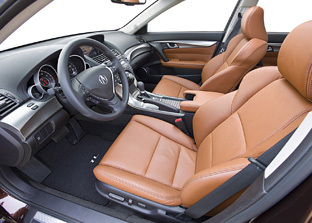 Aside from the distinctive grille the rest of the 2009 Acura TL is quite unadventurous, a plus in the sort or discreet luxury segment it is aimed at. 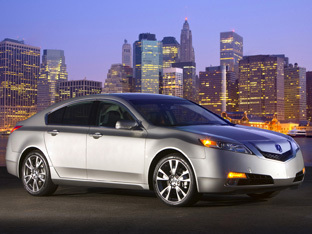 Powering the Acura TL is a choice of two engines. Standard fitment is a 3.5 litre V6 which develops 280 horsepower and sends its power to the front wheels through Acura's Sequential SportShift 5-speed automatic transmission with steering wheel mounted paddle shifters and Grade Logic Control. 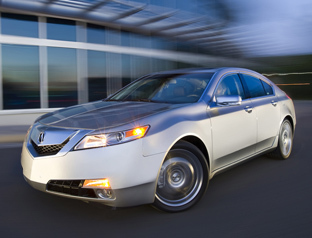 For the more performance conscious there is the Acura TL SH-AWD model, equipped with a 3.7 litre V6 option which manages to produce a respectable 305 horsepower and 273 lb-ft of torque at 5000 rpm. During rapid cornering, the SH-AWD system distributes more torque to the outside rear wheel to create what Acura call a "yaw moment" to help the the car turn in faster. Available on both the Acura TL and TL SH-AWD is a technology package that includes the most comprehensive array of advanced electronic features ever offered by Acura. The Technology Package includes the Acura Navigation System with Voice Recognition, AcuraLink real-time traffic, AcuraLink weather with Doppler-style radar mapping, an Acura/ELS Surround premium audio system and Keyless Access System with pushbutton ignition. The included Navigation System features a new 8-inch full VGA high-resolution color display for improved visibility.